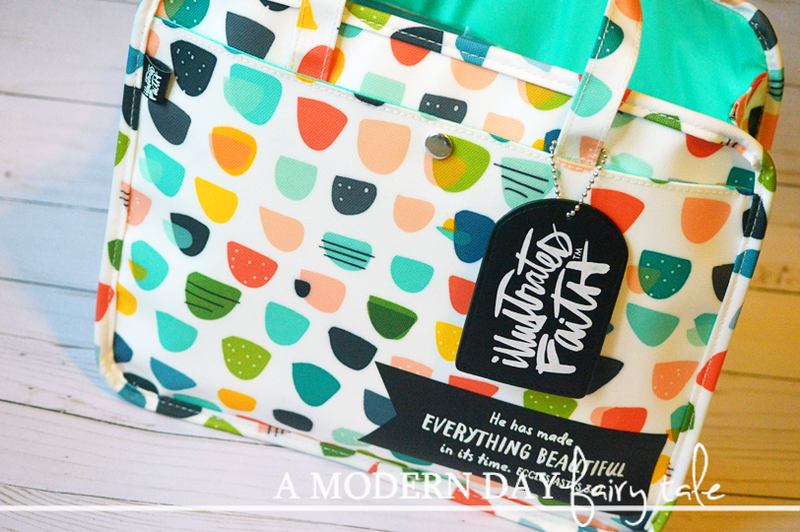 **I received these products as part of the Dayspring Illustrated Faith Launch Team. Post contains affiliate links. All thoughts are 100% my own. "An hour, I found one hour!" As a mom to two little ones, my time for journaling is often...well, hit and miss! I have to find time wherever I can, so when I find time to actually get a page done, I have to make the most of it. When time and inspiration line up, I just need to sit down and do it while I can. But where did all my supplies wind up? I know just what I need, but WHERE is it!? Zipper Pouches are a MUST! 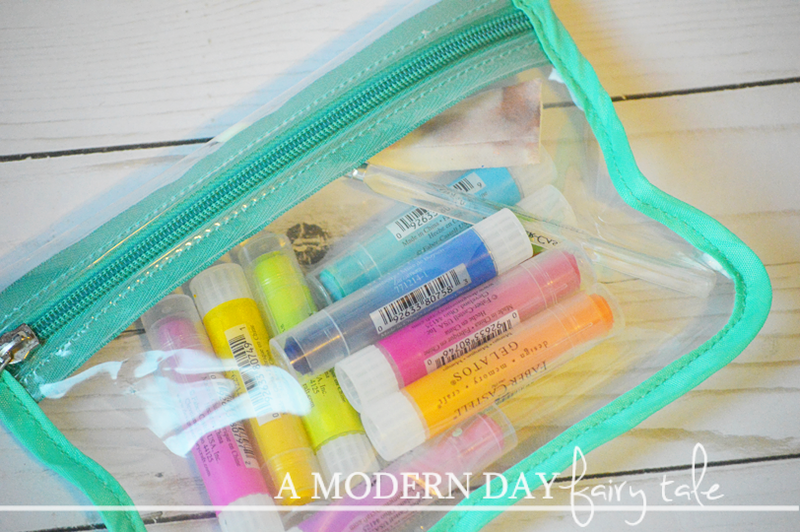 One of my favorite tools for organizing are zipper pouches. They come in a variety of sizes to best fit your organizing needs, and can be quickly tossed into your bag for journaling on the go. Keep It Separate! When you have a wide variety of supplies, separating by type can be really beneficial. This is where those zipper pouches come in handy. I have one with stickers, one with die cuts, one with paper clips, etc. If I know I have a die cut that would be perfect for a page that I am working on, I love not having to sort through stickers and clips to find the die cuts. BUT Keep Your Most Used Supplies Together. Though most everything I have is separated by type, there are some supplies, those I use most often, that I keep together separate from the other like supplies. This could be pens, glue stick, alpha stickers, scissors, a particular paint color or washi... whatever you feel like you want the easiest access to! For me, my most used supplies are Illustrated Faith, so I actually have those separated from the rest of my supplies, then further organized by type among them. Still all are kept in a central location so they can be easily grabbed as needed. Plan Ahead. Sometimes, I get this great idea for a Bible page as I'm listening to music or reading, even just working around the house... but I don't have time to actually journal in that moment. Still, it can be helpful to set aside those things I do need when the idea comes so that when I make time to journal, it's already ready. Likewise, if I am working through a devotional (such as the Illustrated Faith monthly devotionals), I will keep things I need for those together so I just have to grab bits and pieces from elsewhere. Once I finish, they go back to their rightful place. It really is such a simple system, but it has worked well for me in helping to make my journaling time as productive as possible. 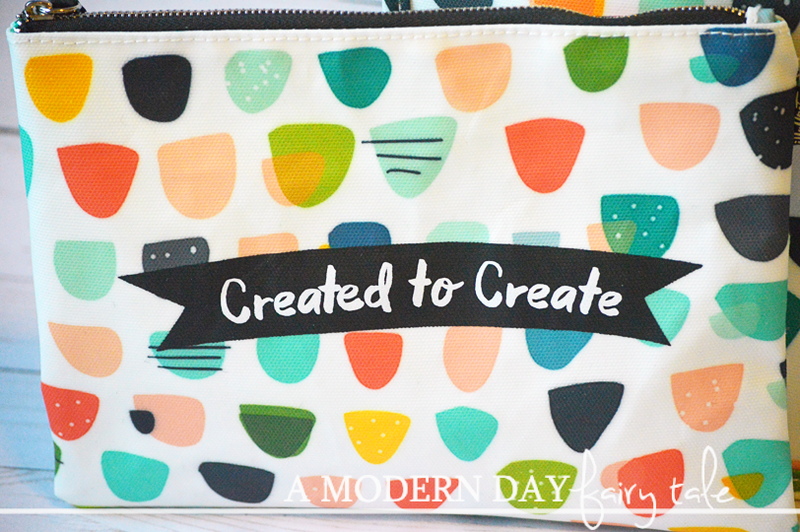 Today, I'm super excited to share with you two great new products from Illustrated Faith and Dayspring that will help: the Kangaroo Pouch and Organization Bag. 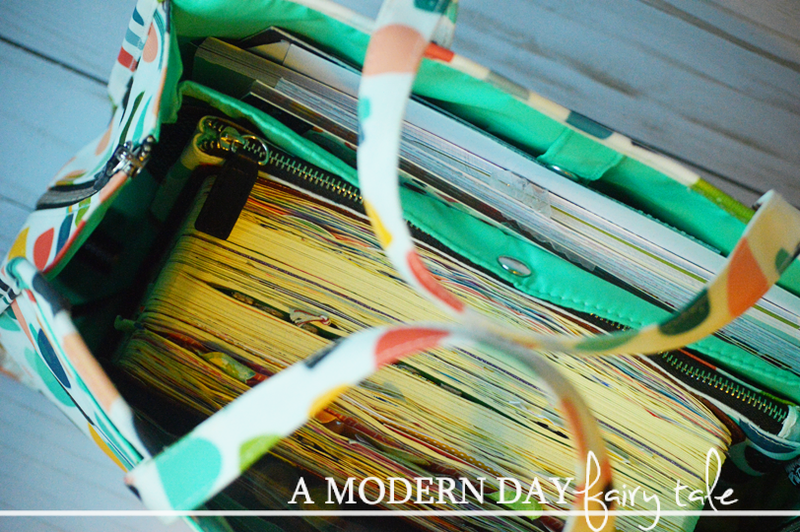 One of the reasons that this zipper pouch system works so well for me personally, is that while I have my craft table where my supplies are stored, primarily I actually journal elsewhere. I can be found on the couch, sitting at the kitchen table, joining my kids on the floor, journaling while they color with me. Very rarely am I actually AT my craft table. That makes these two products perfect for my personal journaling needs. First up, the Kangaroo Pouch. Like I said, I already love and use a zipper pouch system, so it is no wonder that I would like this one. But what sets this apart is the fantastic elastic band that allows you to wrap the pouch around your Bible. 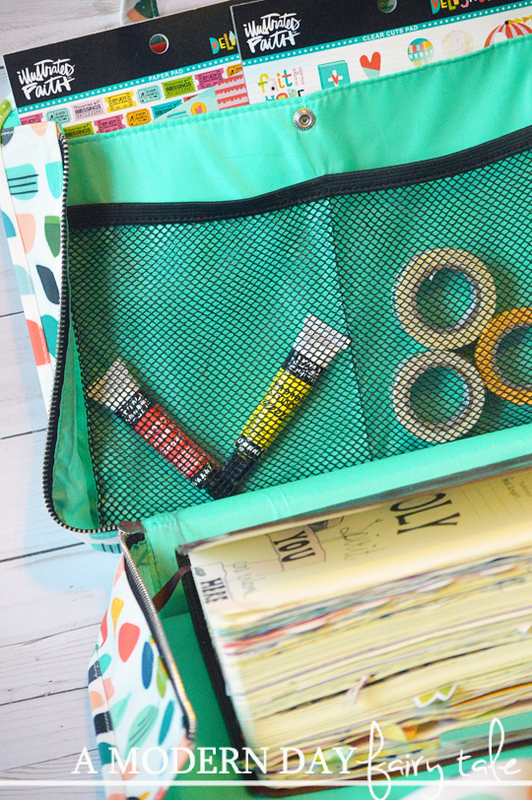 This is great for those most used products, or for keeping supplies for the project you are currently working on, so when you don't need your full bag of supplies, you can use this! Again for someone who is on the move while journaling, this is ideal. And even when I don't want to put it on my Bible, the strap makes it easier to manage, just throw it on my arm and go! Next up, the product I am most excited about- the Organization Bag! 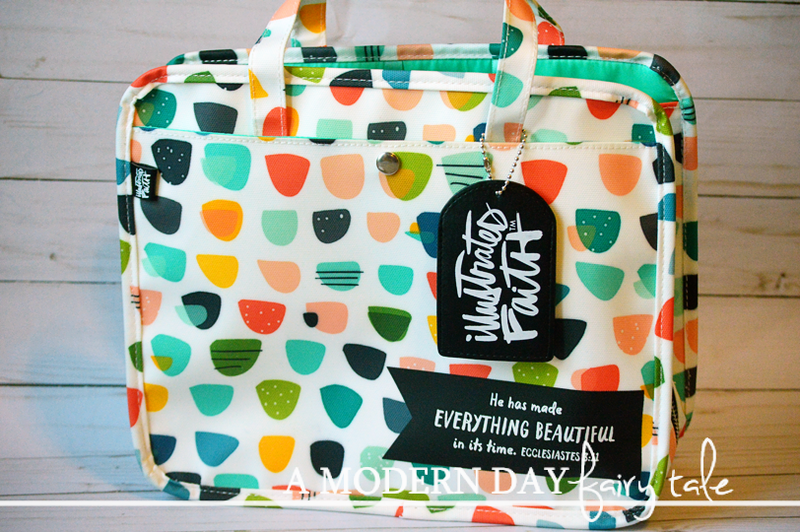 First and foremost, this bag is gorgeous! I love the fun design featured on both products, but I particularly love the verse. The first thing you see when you walk up to my house is a sign featuring just that sentiment. My makeup bags, jewelry rack, and mirror...all also featuring Ecclesiastes 3:11. It is one of my personal favorites, and so I loved to see it featured. But aside from that, the bag is also very practical. On the outside, you will find a pocket on each side. These are not especially wide, but perfectly hold a paper pad, or several sheets of stickers, or even a devotional. Inside is even more space! When you've been journaling awhile, your Bible tends to double in size it seems! Mine certainly has, but I still had plenty of room left for supplies. Even when using my much larger Interleaved Bible, there was still space. (You can watch my video here to see just how much I was able to fit...with still more room.) The mesh pockets are perfect for smaller items like scissors, paints, washis... easily accessible and you can see just what you're getting. 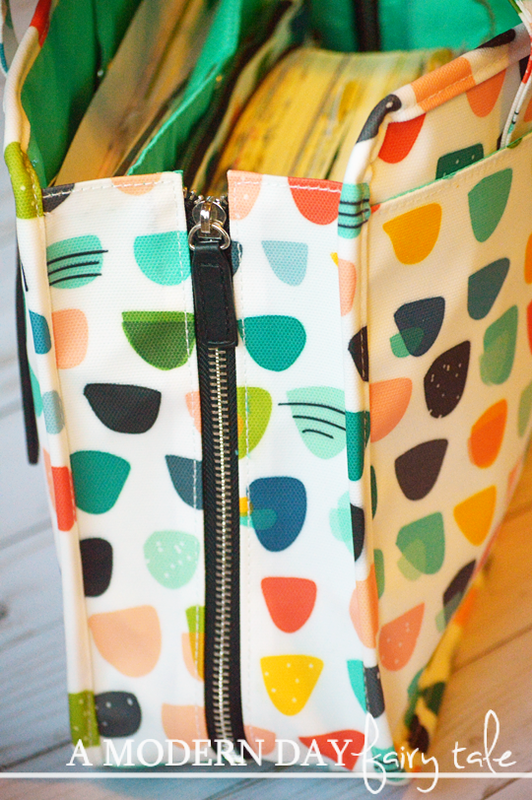 There is also a larger interior pocket that is the perfect size for stickers, devotionals paper pads, etc. This is deeper than the outside pockets so you can fit much more! And again, back to my own zipper pouch obsession, I love that this includes two different pouches, that coordinate perfectly and are just the right sizes for everything I need. Whether you are journaling on the go or just want to better keep organized at home, these new products are ideal. And these are just a few of the new products available today through Dayspring. In fact, they have just launched over 100 new Illustrated Faith goodies! Wow! New collections, new products... you do NOT want to miss any of this! I will be sharing more throughout the week, but don't wait! Head on over to check it all out now! Don't forget to use the code 25FORYOU to save 25% off your purchase + free shipping. There is no minimum purchase so whether you want to stock up, or just grab a few new pieces, this is a great deal! Offer expires March 31, 2017. 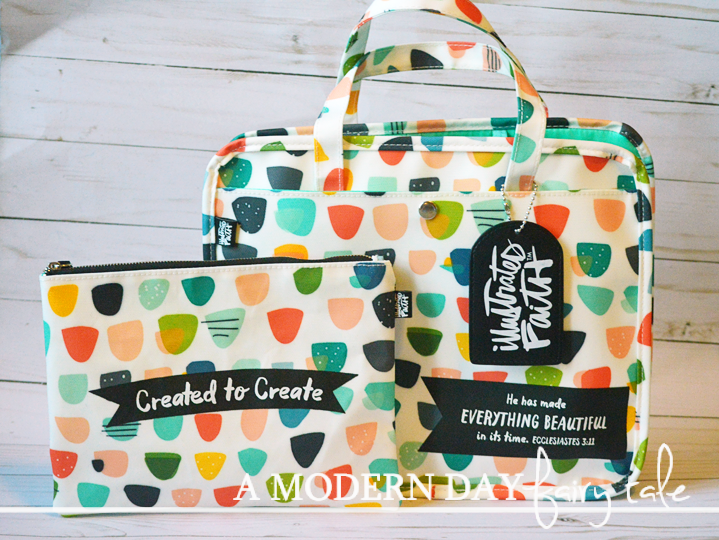 Do you have a system for Bible journaling organization? How can these new products make journaling easier for you? I have a crazy zipper pouch/bag obsession lol!!! These are so cute! !